Tonight while checking one of my lesser checked email addresses, I was excited to be greeted by the subject line "SAN DIEGO GULLS ARE BACK ice hockey PRE BUY TICKETS NOW". I quickly opened the email wondering what league they had joined; returning to the ECHL, maybe into the SPHL or MAHL, or perhaps some brand new league I had not yet heard of!?! 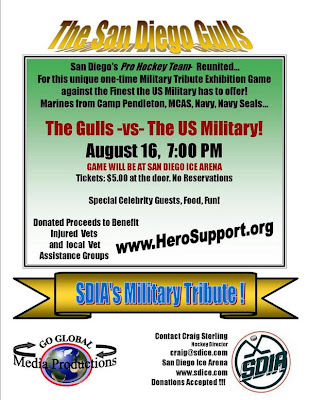 Turns out, San Diego's Pro Hockey team is reuniting for a unique one-time Military Tribute Exhibition game against the Finest the US Military has to offer; Marines from Camp Pendleton, MCAS, Navy, Nave Seals... The Gulls vs The US Military! August 16th @ 7:00 PM at the San Diego Ice Arena. As I huge fan of the Gulls, I sure wish I was able to attend the game. It would sure be fun to see the a team skating around in those great Gulls jerseys once again!